See how artist John Nava created this major work of art for the new Ronald Tutor Campus Center. 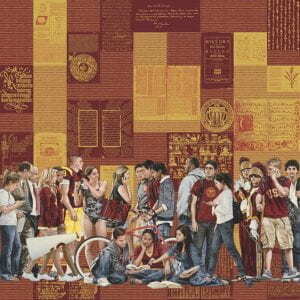 Commissioned in 2008 by Ronald Tutor Campus Center Art and Trojan Traditions, under the advisement of Fisher Museum Director Selma Holo, the Trojan Family Tapestry was created by world renowned artist John Nava. This exhibition will feature Nava’s paintings and show the processes by which the final tapestry was created. The exhibition will contain 15 figure studies in oil on panel or linen, various tapestry “test pieces” as well as other paintings by Nava. Once commissioned, Nava made frequent trips to the university from his home and studio in Ojai, California photographing life on campus and the Trojan Spirit. He also attended a USC football game. The finished tapestry now hangs as the signature work of art in the newly constructed Ronald Tutor Campus Center and features 21 life-sized figures, drawn from studies of USC’s own students, faculty, and staff. The figures walk across a field of knowledge, created from historical documents from the collections of USC Libraries, including a 13th century Koran, a 17th century illustrated edition of Don Quixote, and the Nuremberg Chronicle from 1493. John Nava, b. 1947, is best known for his series of tapestries at the Cathedral of Our Lady of the Angels in downtown Los Angeles. His work is found in numerous private, corporate and public collections throughout the United States, Europe and Japan, including the National Museum of American Art in Washington D.C.